David Liaño. Climbing, paragliding, sailing. Adventure. At the end of each year I take some time to think about what I've accomplished over the last 12 months. The holidays are a great time for reflection. Besides bringing back some pleasant memories, doing it helps me learn from my mistakes. It helps me analyze situations where I could have done better. Some years I keep those notes to myself and others, like this time, I prefer to share them. 2017 was a very good year in my personal and professional life. Although the outcome of every project and challenge was not the one I would have hoped for, when aiming big, the chance of failing is also significant. I often say that by definition an adventure has an uncertain outcome. But there's no way to succeed if you are not willing to take risks, even moderate ones. -The injury came from doing too much over a short period of time. I have to be smarter when scheduling my races, giving myself enough time to recover. -I have to be more patient and truly rest my body when I have an injury. And I have to get back to my training schedule in a more relaxed, intelligent way. -As I age, my body will need more time to recover from injuries than it did years ago. I have to be conscious of this all the time. -Train smarter. All the running that I thought would get me ready for X-Alps ended up being too much and overtraining lead to a complicated and stubborn injury. -Dedicate even more time to building up speed while swimming, so the effects of the currents will be less significant. -Go on a much better spot during the neap tide. I was 4th in line this year and now I'm scheduled for 2nd in line for September of 2019. -Get a better coach, one that will be more involved in my training, and a much better boat pilot. I'm not blaming anyone other than myself not making it this year but I can see that my choices were poor. -It's ok to take a break and enjoy other things. To give life some balance. The mountains will be waiting and I will go back with much more energy and passion. For 2018 I have the most ambitious mountaineering project I've ever set for myself and I will be talking about it very soon. An area where everything went much better than planned: my philanthropic endeavors. I prefer not to go into details here but I'm very pleased with the time and resources I've put into helping others this year. This may sound surprising to others but the most challenging side of 2017 was, as it has been over the years, the way I interact to other people. Because of Asperger's Syndrome, some interactions with other people are difficult for me. Social skills that are inherent in others are unnatural to me. For reasons that I can't understand, people come and go from my life. Even people that I would like to remain close to tend to drift away. Since I don't have those social skills, can't figure out a pattern of why it happens. In any case, I will continue trying to keep a close relationship with the exceptional people that come into my life from time to time. I will strive to build stronger, long-lasting personal relationships with them. No year is perfect. But they don't really have to be perfect. Things that are out of our control will derail our plans, but how we react is up to us. 2017 was a very good year for me and I hope it was for you too. Life still continues to be a great adventure. A very exciting and rewarding adventure. I recall my father telling me the story of an older man who had trouble with some of the younger kids in his neighborhood. Every day, a group of teenagers would come by his home and throw rocks at it. The old man did everything he could to stop the mischievous boys from throwing those rocks. He called the police, called the boys’ parents, and shouted threats at the boys from his porch. Nothing he did seemed to stop their behavior. In contrast, the young men seemed more encouraged than ever to keep throwing. In desperation, the old man met with the boys and struck a deal. “Boys, I want you to know I’ve changed my mind about how I’ve been feeling,” he said. “I have come to enjoy you throwing rocks at my home. For that reason, I am willing to pay each of you a dollar every day that you throw rocks at my house.” Although bewildered, the boys enthusiastically agreed and began to show up each day at the appointed time to throw the rocks. As understood, the old man happily paid them a dollar each. This went on for a few days, and then the old man approached the boys and said, “I have been having some financial troubles lately and I can no longer afford to pay you each a dollar. Would you be willing to consider fifty cents?” After conferring with each other, the boys reluctantly agreed to keep throwing rocks at his house for just fifty cents each. Then another few days went by before the old man approached the boys with more bad news. “Boys, I have really fallen on some financial hard times. I cannot afford to pay you fifty cents a day. However, I could still pay you each a dime for throwing the rocks.” The boys exchanged glances and then one of them abruptly said, “There is no way we are going to throw rocks at your house for only a dime apiece.” And with that, they left and never came back. What happened? Before, the boys were willing to throw rocks for nothing. They were "internally" motivated by the sense of adventure, variety, bonding, element of risk, and desire to belong. When they began accepting money for throwing rocks, their motivation slowly shifted to external resources - financial reward. In a short time, they forgot why they ever did it to begin with. When the financial rewards were eliminated, their motivation was gone. This little story explains exactly the way I feel. With sponsorships, there comes a time when even the simplest hobby becomes a job. The motivation changes from internal to external. I would never judge other athletes that do it but it's just not for me. Simply put, my motivation is to live a unique and exciting life full of meaningful experiences and sharing them with others. I'm grateful and proud to be able to do it by my own means. I often read the stories posted on The Live Love Laugh Foundation’s website about people overcoming depression and mental health issues. I really recommend checking them out whenever you or someone close to you is going through a difficult time. You’ll realize you are not alone, and there is hope. Once in a while I hear stories about extraordinary people overcoming great odds on the way to recovery from a major accident or injury. Three weeks ago I witnessed one of those moments when I climbed Yalung Ri, a 5,600 meter peak in the Himalayas, with Tshering Dorjee Sherpa. Let me share his amazing story with you. Tshering was born 46 years ago in Kharikhola, a small village in the Solu-Khumbu region of Nepal. This part of the Himalayas has given us some of the strongest climbers on earth, in part because of its altitude above sea level. But Kharikhola is only about 2,200 meters high, which is significantly lower than most of the other Sherpa villages. His father was one of the village Lamas and he was the fourth of six children. He had three sisters and two brothers. He lived a normal childhood until age 5 when, as was traditional for the second son, he entered the local monastery. As a monk he was given a new name: Nawang Nuru. He grew up in the monastery and received a much better education than the average child in Nepal. He spent 3 years in the monastery at Tengboche at 3,800 meters with panoramic views of Mount Everest and surrounding peaks. In Nepal, like in other countries in South Asia, it is traditional for the oldest son to be the financial support for the whole family, especially to take care of their aging parents. Tshering had one older brother that worked as a trekking guide but that completely refused to give any money to his family. This rejection was hurtful to the parents and put the family in a difficult position. Because of his family duties, Tshering was forced to leave the monastery after 15 years at age 20 to go to work. He would have to support his parents and the rest of the family financially. In his place, I would have been terrified. Forced to leave the sheltered and comfortable life at the monastery and face the “real” world, knowing that half a dozen people were depending on him to survive. He left his monk robes behind and travelled to Kathmandu. He found a job with a trekking company as a cook’s assistant. When he talks about this job he says he was a “kitchen boy”. In 1993 he was hired by an Indian expedition to Mount Everest as a “Mail Runner”. Before satellite internet and mobile phones, expeditions would communicate with the outside world by having people run up and down the mountain with letters and telegrams. It took Tshering 2 days to get from Everest Base Camp to Lukla to deliver outgoing mail and to pick up any letters for the expedition. The next day he would start back up and reach Base Camp on the 4th day. That’s a 130km round trip in 4 days across the Himalayas. As you can see, he is an incredibly strong person. Most of the money he earned was sent to Kharikhola to support his family. Up to this point, he had worked with treks and expeditions in small supporting roles but he had never climbed a mountain. He had received no training in mountaineering, had never used crampons and had no experience at altitudes above base camp. For these reasons, I find his next move so puzzling. In 1995 he was hired by Mountain Madness (run by Scott Fisher at the time) to climb Mount Everest from the North side. Although the route is not technically challenging, keep in mind that the first mountain he ever climbed was the highest mountain in the world! Very few people can say that. He did other trekking jobs and was part of an unsuccessful Everest expedition in 1998 reaching 8,300 meters. That year he married Riku in a Sherpa wedding in Thame but they still live in Kathmandu. The next year they had their first of two daughters. 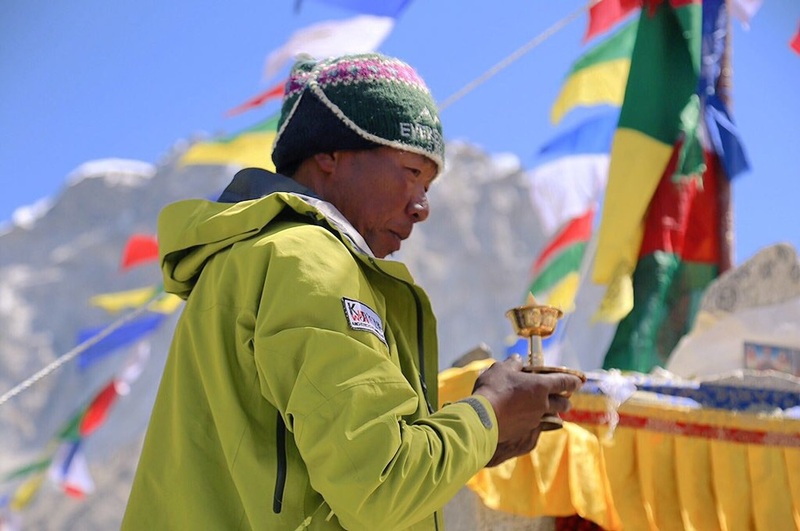 Tshering continued working as a climbing Sherpa with successful summits of Everest and other 8,000 meter peaks. I finally met him in 2004 when I climbed Cho-Oyu and he was supporting our expedition. I would’t have imagined how much time I would be spending with him and how many mountains we would climb together. In 2005 I climbed Everest for the first time and again he was supporting that expedition although we didn’t reach the summit together. But through the next 5 years I kept meeting him one or two times every year during climbing expeditions. Then, tragedy struck. One of the Sherpas that I had come to know very well was Chhewang Nima Sherpa. We climbed Everest together once. Sherpas are generally kind people but Chhewang treated me like a brother. His story is one I will write some other time but, finding ourselves again on Everest on different expeditions during the spring of 2010, we made plans to climb Ama Dablam with my father on October of that year. Sadly, just two weeks before we were scheduled to meet in Kathmandu, Chhewang was swept by an avalanche while climbing Baruntse. He was killed and his body has not been found yet. Because of this tragic accident, Tshering Dorjee stepped in to join us on the expedition and we summited Ama Dablam together. In 2012, Tshering and I climbed Lobuje East and he also joined us when I climbed Island Peak with my father. But most importantly, he was there with me in 2014 when I had a paragliding accident in the Rolwaling Valley of Nepal. He was the only one with me when I crashed as I took-off and I was unconscious for about 10 minutes. He thought I was dying and he was very scared. When I came around he helped me walk back to Na village and get our things ready to jump on the helicopter that took us to Katmandu so I could get to a hospital. The next day, he took me to a monastery in Boudhanath to give a prayer of gratitude because I had survived with “minor” injuries. As you can see, Tshering was one of the strongest people I knew and one that I trusted with my life. He had summited Mount Everest 16 times as well as Cho-Oyu 11 times and Lhotse one time. In May of 2016 his life took an unexpected and unfortunate turn. In the Spring of 2016 Tshering Dorjee returned to the North side of Everest to climb with a team from Chile. They reached the summit on May 23rd and went down to sleep at Camp 3 at 8,300m. During the descent to the North Col he began feeling dizzy and continued heading down as, typically, loosing altitude will take care of most altitude sickness problems. But back at Advanced Base Camp the dizziness became more intense and he was vomiting periodically. Still, he descended all the way to Base Camp and by the night of the 27th he was so ill he couldn’t move. A Jeep arrived the next day to evacuate him to Nepal and he had to be carried from his tent. They left early morning and by mid afternoon they had crossed the border into Nepal where a helicopter finally picked him up and he was taken to a hospital in Kathmandu. The doctors at that first hospital diagnosed him that day with an “altitude problem”. He had descended more than 6,000 meters but still he couldn’t even sit down, he was vomiting and he was extremely dizzy. Concerned with how vague the diagnosis was, his family took him to another hospital where a doctor finally diagnosed him with a stroke. The strong, tough Sherpa was put in the ICU. He says he felt hopeless and very sad, and I believe he was describing symptoms of depression. After some time, his physiotherapy began. He couldn’t sit down without someone holding him, he couldn’t lift any object. Day after day, with the support of his family, he tried as hard as he could to learn again the movements that had come so natural before. He was still constantly dizzy but he still tried. It took nearly six months before he could walk without assistance. Just a few steps at a time. Also as therapy, he goes swimming, trying to get back the strength he had lost. On October 9, 2017 Tshering and I rode a Land Cruiser for 8 hours from Kathmandu to Chetchet on some of the worst roads I’ve ever been on. During the next three days we hiked up to Na village at 4,200m. The memories of my accident came flooding back but I was ready to move on. The next day we moved to our high camp at 5,000m and that afternoon Tshering’s eye hemorrhage returned but he was determined to give it a try. It was a very peaceful night inside our tent. Yalung Ri is not technical peak but there is a long, steep glacier near the summit. It was the first time he used crampons since the stroke and he walked slowly but confidently. Roped together, we made our way up zigzagging along the crevasses until we reached the summit. He described reaching the summit as a moment of total happiness. He told me he felt he had been born again, given a second chance. “This has been a wonderful year!” he said. After shooting a short video and taking some photos we began descending. On the way down, Tshering slid twice on the snow slope and I had to belay him, a reminder that although his recovery was astonishing, there’s still a little way before full recovery, if he’ll ever get there. But I can say that the man I saw at the beginning of the Yalung Ri climb was not the same that came down that day. The confidence was back. The Sherpa was a climber again. On the way to Marathon des Sables 2017 and why I'm running it. As I write this I’m 35,000 feet above the ground, flying from North America to Europe and then to Africa to run the Marathon des Sables in the Sahara Desert. It’s been 8 months of planning and training, and I’m finally on the way to Morocco. But first, let me tell you about this crazy race called Marathon des Sables (MDS). Running any marathon, 42.2km (26.2 miles) is tough. Now imagine running the equivalent of 6 marathons in six consecutive stages for a total of 256km (the longest stage is about 80km long). Then consider that you are going to be running in the middle of the Sahara Desert, making your way along the sand dunes and rocky desert terrain. But on top of that you have to carry a backpack with all your food and supplies, and the race organizers only provide you with water and a bivouac for the night. That is the MDS. On September of 2016 I signed up for MDS. Since then I’ve spent countless hours researching the best gear I should use, the most efficient way to prepare, and reading other runners blogs to learn from their mistakes. I learned that most of the runners end up suffering from horrible blisters during the race so I’ve done all I can to prepare for this: getting the right kind of shoes and socks, breaking them in, attaching gaiters with velcro to keep the sand out, etc. Training for MDS has been tough. The biggest difference with training for a regular marathon has been adding back-to-back long runs. Because of all the traveling I’ve done, to prepare for this race I’ve had to run in 4 different continents. When I get to Africa, it’ll will be 5! It’s been a long learning curve but I feel very confident that I will get myself across the finish line and hopefully enjoy it. -This is the 32th time it’s been organized. -About 1,200 runners will participate this year. -We get a limited amount of water every day, depending on the distance we have to cover that day. -At the starting line, our backpacks must weight a minimum of 6.5kg and a maximum of 15kg. -We must start with food that has at least a total of 14,000 calories, or 2,000 per day. But we may end up burning between 4,000-8,000 calories per day. -At night, we share a bivouac tent with seven other runners and it’s mandatory to carry a sleeping bag. -Another mandatory item: venom extraction pump, for snake bites. -Temperatures can range from over 40ºC during the day, to close to 0ºC at night. -There’s a time limit to complete each stage. The limit for the longest stage is usually 34 hours. -We are provided with satellite trackers. Every runner has their own motivation when running MDS. My motivation is setting myself a goal and doing everything I can to complete it. In this case it’s simply finishing MDS. But there’s something much bigger and important motivating me to run across the Sahara Desert: supporting The Live Love Laugh Foundation and helping raise awareness about depression and mental health issues. To do this, I summited Mount Everest in the spring of 2016, ran the Chicago marathon 6 months ago and later climbing other peaks in the Himalayas. Bringing to light the conversation about mental health and depression has been my way of supporting the Foundation. When running MDS in just a few days, you can be sure I’ll be thinking of the people that go through depression and how just getting through the day can be difficult for them. The challenge I’ll face with MDS will not be remotely close to the ones they go through to recover, but it’s my way of showing them they’re not alone. With the right support they will recover and get through it. Through their example, I'll give it my best and hopefully get to the finish line of MDS. There’s no doubt that climbing mountains is a thrilling experience. But climbing a mountain that has never been climbed before is an adventure like no other. I’m on the way to Nepal to be part of the team trying to be the first to climb Burke Khang, a 6,942-meter mountain very close to Mount Everest. And I’m doing it in association with The Live Love Laugh Foundation (TLLLF) to support the Dobara Poocho (Ask Again) campaign. Earlier this year, I was able to summit Mount Everest for the sixth time. I stood on the summit with a banner that I had carried with me all the way from Bangalore, India. The banner had the Foundation’s logo and the message #YouAreNotAlone. Without a doubt, it was the most meaningful of my Everest climbs and I still get emotional reading the messages I received, during and after the expedition, from people going through mental health issues. A month after summiting I had the opportunity to spend some time with Deepika Padukone, TLLLF Founder, as well as Anna Chandy, Chairperson, Dr. Shyam Bhat, Trustee and Aashu Calapa, Director. Sometimes, fate brings remarkable people together to achieve a common goal and the result is just as extraordinary. I believe that’s the case for the people behind the Foundation. In particular, I was struck by Deepika’s kind and down to earth manner. When she talked about helping people with mental health issues, I saw nothing but a genuine desire to help. I was very proud to be involved with such an amazing group of people. After that meeting, I traveled to Europe to participate in the Paragliding World Cup in Portugal as well as X-Pyr, the hike and fly race across the Pyrenees. I also ran the Berlin marathon on September 25th and two weeks later I ran the Chicago marathon to celebrate the Foundation’s first anniversary on October 10th. That day, the Foundation launched its Dobara Poocho campaign. It urges people to take an active role in reaching out to others (“ask again”) who could be suffering from mental health disorders and to bring mental health into the mainstream conversation. In the next few days, I’ll be writing about the Burke Khang expedition, why I’m climbing that particular mountain, who I’m climbing with, and the story behind the peak’s name. Summiting an unclimbed mountain will be a unique personal experience. But I know that the real satisfaction comes from doing it to raise awareness about mental health and the Foundation’s Dobara Poocho campaign. Reaching the summit for a higher purpose makes it the perfect adventure. Desde hace casi 9 años he ido compartiendo públicamente las expediciones de escalada, viajes de navegación, vuelos y demás aventuras que he tenido la fortuna de vivir. La intención de abrir una ventana a mi vida nunca ha sido con el objeto de vanagloriarme o de cualquier manera alardear de lo que he logrado. Al ser todas ella experiencias y metas personales, la satisfacción también es personal y ajena a cualquier reconocimiento de terceros. También, quienes me conocen estarán de acuerdo cuando digo que soy una persona muy reservada y lo opuesto a una personalidad histriónica. Entonces, ¿por qué publicar en redes sociales y en un blog estas experiencias personales? La respuesta es simple pero hace falta hacer un poco de historia. Llevo 23 años escalando montañas y 13 de ellos han sido expediciones al extranjero. Muchas han sido a lugares verdaderamente remotos. Lugares de los que se leen en los viejos libros de aventuras y exploradores, lugares que generan curiosidad e interés. Por eso no es extraño que al regresar de una expedición a África o a Papua Nueva Guinea los amigos y familia con los que me encontraban quisieran que les platicara sobre mis experiencias. Lo hacía con mucho gusto. En 2008, aprovechando la tecnología disponible, tuve la idea de escribir un blog durante la expedición al Everest y Lhotse. De esa manera, en vez de que al regresar a casa tuviera que repetir la misma historia decenas de veces, mi familia y amigos podían ir viviendo esta expedición conmigo día a día. Las conversaciones que tenía con ellos a mi regreso eran pláticas como las que tendría con un compañero de la expedición. Como si hubieran estado ahí. El compartir las aventuras a través del blog y redes sociales tuvo una consecuencia positiva. Al ser una página pública, mucha gente a la que no conocía podía leer sobre mis experiencias y esto las motivaba a tratar de vivir las suyas. Pienso que muchas veces lo que más cuesta para iniciar un proyecto personal que todavía es un sueño o un deseo, es dar el primer paso para iniciar a planearlo y a ejecutarlo. Y fueron muchas las personas que se pusieron en contacto conmigo para comentarme que gracias a lo que habían leído de mis proyectos se habían animado por fin a dar el primer paso para hacer el viaje o vivir la experiencia que siempre habían deseado. Se convirtió en un círculo virtuoso. Entre más compartía, más comentarios recibía de gente viviendo grandes experiencias personales. Aprecio mucho el poder vivir en una época en la que la tecnología nos permite estar conectados, y en contacto tanto con gente cercana como con desconocidos. Pero sobre todo aprecio la oportunidad de poder abrir esta ventana a mis experiencias. Y, si sientes que en algo puedo mejorar, los comentarios constructivos siempre son bienvenidos. It’s been two weeks since the official end of X-Pyr 2016. My personal experience as participant in this amazing race was too short. On day two I caught a thermal just a few meters off the ground while I was already committed to land and ended up crashing into a barbed wire fence. I was incredibly lucky to have hit a post with my shoes and avoided hitting the spikes with my body. But my paraglider wasn’t as lucky. It was still traveling at a high speed and the barbs caused severe damage to about 25% of my wing. I considered the situation with Alex, my teammate, and we agreed that it was a complex repair, not something we could just tape up and it was a significant safety risk. We didn’t have a backup glider and it was impossible for us to buy, rent or in any other way get another glider within the next few days. I even told Alex I would pack my damaged glider and walk as far as I could, without the possibility of flying, until the race was over. He smartly talked me out of this idea. We decided to call the Race Director and let him know that we were retiring. Our race was over. For us X-Pyr involved months of planning, training and dreaming. It wasn’t easy to take a step back and see three amazing athletes and pilots make it all the way to the Mediterranean. But because of my background as a mountaineer I understand that there are variables that are outside of my control, that I can’t change and therefore I should accept and move on. That uncertainty is the nature of adventure races like X-Pyr and that’s part of what draws us. My definition of adventure: a journey in which the outcome is uncertain. X-Pyr is definitely an adventure. Preparing for the race, and the race itself can be a logistical nightmare for participants and assistants. But it doesn’t compare to the extraordinary effort made by the race organizers. While we have mandatory rest periods from 22:30 to 5:30, they kept going all night looking after us. I’m extremely grateful to Íñigo Redín and his amazing team for putting together such a complex race, and still make it challenging but fun for us. I would also like to thank my teammate Alex for planning and dreaming being a part of this adventure with me. You can always expect him to keep a cool head and a smile, and he won’t disappoint. So what’s next for me? Paragliding competitions, summiting an unclimbed peak in the Himalayas, marathons, ultra-marathons and multi-stage adventure races in the desert. And that’s just until the first half of next year! But I’m sure that wherever I am and whatever I’m doing, on the back of my mind I will be thinking of X-Pyr 2018 and reaching El Port de la Selva. When in the middle of January of this year I received the email confirming that our team had been selected to participate in X-Pyr 2016, I first felt thrilled and proud to have been chosen for one of the biggest and most exciting adventure races in the world. My next thought was, “you better get it together because the first half of this year will be one of the most challenging of your life”. I’m no stranger to tough challenges. I’ve been climbing mountains for the past 23 years and among many other achievements I’ve stood on the summit of Mount Everest (8,848 meters) 6 times. I began paragliding as a safer and more efficient way of getting off the mountains and I’ve participated in many competitions. 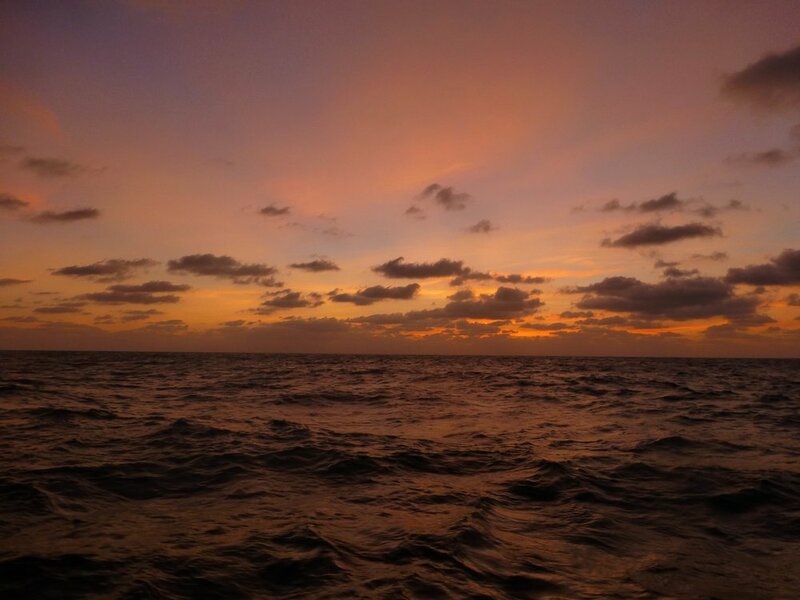 I’ve sailed offshore for thousands of miles, mostly singlehanded and I’ve run in about two dozen marathons, Ironman triathlons and hundreds of road races. But this year would be especially challenging because I had to run a marathon in February, I had to train for and climb Mount Everest again during the spring and I had to get ready for X-Pyr. My teammate Alex Gonzalez was a big help with planning the logistics for X-Pyr while I concentrated on my climbing expedition. 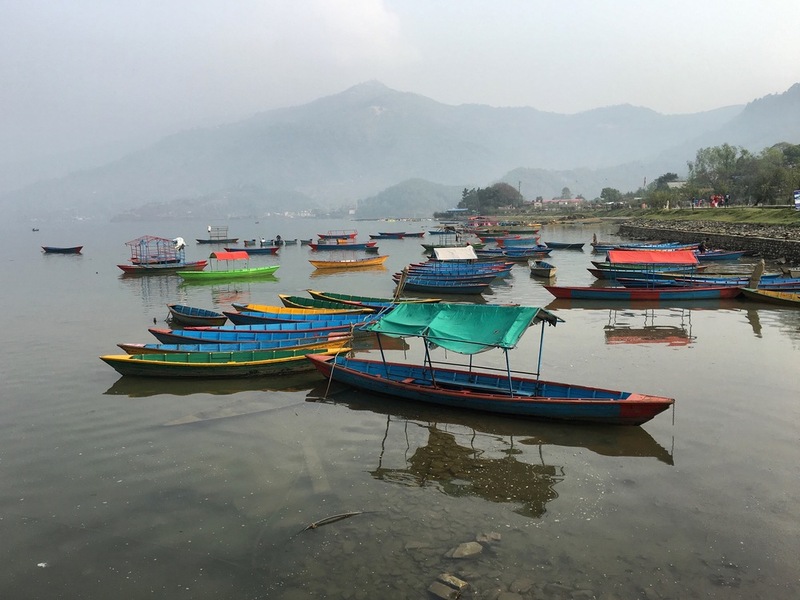 I flew to Nepal on March 28 and went flying in Pokhara. It’s one of my favorite sites. On April 7 I flew to the Himalayas and began the trek to Everest Base Camp, climbing a 6,200 mountain on the way. I arrived at Base Camp on April 19 and began the slow process of getting acclimatized to the altitude. My plan was to try to climb without supplemental oxygen but, as I was climbing in association with The Live Love Laugh Foundation trying to raise awareness about the dangers of depression and mental health disorders, I made the decision to give up my personal goal and reach the summit with the Foundation’s banner. I got to the summit on May 12 climbing with Pa Rita Sherpa on a day with perfect weather conditions. It was my 6th summit. As I returned to Base Camp the next day my mind went from climbing mode to hike & fly mode. Everest was behind me and X-Pyr was where I would focus all my energy and time. I returned to Mexico a few weeks later and one of the first things I did was to go to Valle de Bravo and fly again. What an amazing feeling to be back in the sky after dreaming about it for two months. I knew there would be a lot of catching up to do with only one and a half months to go before the start of X-Pyr. During the weeks leading to X-Pyr I will be flying more than I’ve ever flown before, and I will be posting updates on this blog and on social media about my training and preparations. Thank you for following me on this adventure. During many of the nights I’d spent at Camp 4 on Everest (8,000m) on previous expeditions, it had been so windy that we even had to push out the tent walls to keep them from collapsing. This time the forecast that predicted a maximum wind speed of 10 mph was completely accurate. And even though I actually didn’t get to sleep, I was able to rest and listen to music until 11:00pm on May 11 when my iPhone’s alarm went off. By then Pa Rita Sherpa was already awake. First we got the stoves going to brew coffee and melt ice to have enough water for our climb to the summit. Because of the lack of oxygen, it takes much longer at that altitude to put on all of our gear and to get ready to leave camp. Just putting on my Millet double boots took about 10 minutes. The gear I was wearing was: two pairs of socks, double boots (with heated insoles), two pairs of long underwear (bottoms, thick and thin), two pairs of long underwear tops (thick and thin), down suit, buff, OR gorilla mask, OR heated gloves, goggles, headlamp, crampons and harness. In my backpack I had extra gloves, down mittens, two litters of water, ice axe, VHF radio and first aid kit. I also packed The Live Love Laugh Foundation’s banner and two of the three oxygen bottles I had available. Finally, in my down suit pockets I put my camera, iPhone and satellite phone. By 12:15am on May 12 we were ready to go and I called base camp on the radio. The final push to the summit began under perfect weather conditions. We could see a couple of headlamps on the route that meant Kenton Cool and his group had decided to start early. We followed their tracks and soon made it all the way to the top of the ice bulge and the beginning of the Triangular Face. Because of the heavy snow on the afternoon before and from previous days, there was much more snow on the mountain than I’d ever seen before. But this particular kind of snow was extremely dry and wouldn’t stick so, even though the four climbers above us had made a great effort to kick steps, when we got there those steps were already covered with snow and we had to do the work all over again. It would be like that the whole way. The five hours we spent climbing in the dark was a surreal experience. Our world was reduced to the area that our headlamps reached. The rest was darkness and it felt as if nothing else existed beyond the light beam. That night there was no moon and the sky was clear so when we took a break and turned off our headlamps, stars began to appear and soon the whole Milky Way followed. I’ve spent a big part of my life in the outdoors and countless nights sailing under the stars but I’ve never seen a night sky so stunning as the one I saw that night. Another amazing thing I saw that night was thunderstorms all around us, thousands of meters bellow. They were so far that we couldn’t hear the thunder but we could see the light show for hours. We continued climbing very efficiently on the way to the Balcony at 8,500 meters. I lead and Pa Rita Sherpa followed. It was such a relief having the mountain to ourselves and not being stuck climbing behind many others. The decision to go early in the season was paying off even if I was using oxygen. While we climbed we didn’t talk much and stopped just a few times preferring to keep moving and stay warm. Although there was no wind, I reminded myself to be proactive and keep moving my toes and fingers, keeping the circulation going. From the Balcony to the South Summit. You can see the other four climbers above us. The next challenge was to climb up on the southeast ridge all the way to the south summit. For me this is one of the toughest parts since I find the two rocky sections difficult. It took us another two and a half hours to reach the south summit. The other climbers were just 50 meters away from us. Although I felt tired, knowing I was so close to my goal gave me the emotional boost I needed to get to the summit. From the South Summit, the ridge towards the Hillary Step. Another challenging section was the traverse on the ridge towards the Hillary Step. This year it had so much snow that instead of climbing over rock we followed a knife-edge snow ridge with many cornices. Then it was time to climb the Hillary Step. But when I reached the place where it should have been, all I saw was a snow ramp and I actually thought the boulders that formed it were gone. I thought they might have collapsed because of the big earthquake the previous year and I later wrote on social media about this. The boulders were just buried under the snow as I later found out. So for us it was just a simple climb on that snow ramp and then we were on the summit ridge. It’s very hard to describe the avalanche of emotions I felt when I saw the four people ahead of us standing on the highest point on the planet. It was a mix of satisfaction, relief and so much gratitude for the people that made it possible for me to be there one more time. When I took the last few steps to the summit I had tears in my eyes that quickly froze to my eyelashes. After giving a hug to Pa Rita Sherpa, and congratulating each other and I removed my backpack and took out The Live Love Laugh Foundation’s banner that was rolled inside. Pa Rita took my photo holding it. We had reached our goal: climbing to the summit of Mount Everest for mental health awareness. We were sharing the message: #YouAreNotAlone. It was 8:24am. When I made the radio call to base camp I could hear the cheers on the background. After 3 years foreigners had reached the summit of Everest from Nepal. It was my 6th time up there. I closed my eyes and silently thanked the thousands of people following the expedition, the Trustees of the Foundation for believing in me. I also took a moment to think about the people struggling to overcome depression and mental health disorders, wishing they will soon get on the road to recovery and to start living a happy life. Having carried my satellite phone all the way to the summit it was time to call my family. It’s very important to talk to them from the summit and let them know how their support had been essential for me to have reached my goal again. Since there was some battery still left on the phone I also tried calling Deepika Padukone to thank her and let her know how the movement she started with the Foundation had reached the highest point on the planet. She showed a lot of courage when she opened up about her problems with depression. That courage was an inspiration to me. After several tries where the call was sent to voicemail, I left her a message and switched the phone off. I thought, “How cool is that? Voicemail from the summit of Everest!”. Finally, I took a few minutes to enjoy the spectacular view: eight thousand meter peaks and massive glaciers all around, blue sky and perfect weather. I had climbed using oxygen, but giving up on my personal goal had been worth it. I had no regrets. As we left the summit, 45 minutes after we had reached it, I looked back and saw for the last time that magical place. I concentrated on noticing every detail and saving that image on my mind. It took us 7 hours to safely climb down to Camp 2. As I lay inside my sleeping bag I began to realize what I had achieved. It was probably going to be my last time up there. For 11 years, Everest had given me some of the toughest and some of the most rewarding moments of my life. Climbing it I had made great friends and I’d seen amazing feats of courage: people putting themselves at risk to save the lives of other. I’m very grateful for all these experiences: good and bad. I also feel unlimited gratitude towards the people that made my adventures on Everest possible. They have helped me get closer to my ultimate goal: to live a meaningful life, full of unique experiences. The Khumbu Ice Fall changes every day. Crevasses open up, searacs collapse and every trip up and down is a different experience. Because of the snowfall later in the season the condition were much safer than the first time I went up. Still, as I climbed with Pa Rita Sherpa, we were careful with every step we took and it was a relief when we reached Camp 2 early in the morning of May 7. After already spending so many days above 6,400 meters that season, my heart rate and breathing felt comfortable that afternoon at dinner in the kitchen tent. Talking with the Sherpas during meals is something I always look forward to. I have been climbing with the same Sherpa team since 2008, nine years, and spending time with them feels like spending time with family. It really feels that way. During my stay at Camp 2 I kept going over the weather forecasts for our possible summit day, May 12, and also the plans for the Sherpa team that was climbing to the summit. It was on May 9 that I was forced to make a decision between using this as my final acclimatization rotation to Camp 4 and try to climb without using supplemental oxygen or to go for an early summit, giving up on my personal goal, and making sure that The Live Love Laugh Foundation’s banner made it to the summit. As mentioned on Part 1 of this post, I felt my work with the Foundation was a priority. I decided to go for an early attempt. I continued the ascent reaching camp 3, at 7,200 meters, after climbing halfway up the Lhotse face on May 10. The climb was over ice rising at an average of 50º. Thankfully there were very few climbers on the route. That’s one of the advantages of going for an unusually early summit: no crowds. It’s never easy to set up Camp 3 since shelves big enough for the tents need to be choppedfrom the ice. 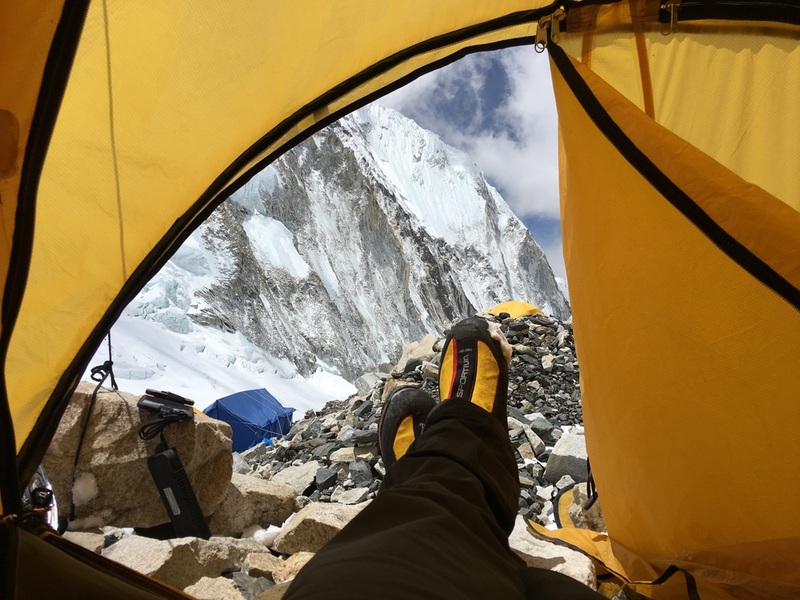 I spent all that afternoon and night by myself since the Sherpas prefer to climb directly from Camp 2 to Camp 4 and spend a more comfortable night at lower altitudes. Enjoying the silence and solitude, I ran the stoves all of the afternoon, melting ice and boiling water, making soup and instant noodles. That’s as far as my cooking skills go on and off the mountains. There was some snowfall on the afternoon, but not more than what was forecasted. Before the sun set below the horizon I was rewarded with an amazing view of Pumori and Cho-Oyu, the sixth highest mountain in the world. I woke up early on May 11. During the night I didn’t sleep much but still felt rested and ready to head up. All my gear was packed when Pa Rita arrived and it was time to move. That morning I had been melting ice for about two hours to have enough water for the whole day. To me, the climb from Camp 3 to Camp 4 is one of the toughest parts of the expedition because you can see most of the route and it never seems to get any closer. We continued to make our way up, passing the Yellow Band and the Geneva Spur. The upper part of the Lhotse face seemed to have more snow than any of the other times I’ve been up there and that was a good thing since when the mountain is dry there is constant danger of being hit by falling rocks and ice. The snow keeps all of that buried. Still, as we reached the South Col, the rocky and icy saddle formed between Everest and Lhotse, I was amazed at seeing it all buried under the snow. We arrived at Camp 4 around 2:00pm and it took us a few minutes to set up a tent and get settled inside. We had been using supplemental oxygen from Camp 3 and that made it a little bit easier. Once we were inside our tent and we had the stoves going it started to snow. For hours we had heavy snowfall and I started to worry about the conditions higher up and how that would affect our chances to summit the next day. I tried to stay positive and reminded myself I’d been at the South Col many times before under worse weather and I knew we would get our chance that night. During the afternoon Kenton Cool, the British climber, came by to talk about our plans and it was good to know there would be four other climbers going up that night. We would be the first foreigners to try to summit form Nepal since 2013. During that afternoon an Camp 4 we also go word on the radio that the Sherpa team had reached the summit. A few minutes later the snow stopped. Finally things were going our way and around 6:00pm I made the final call to start climbing for the summit that night at 12:00am. That meant we would have just 5 hours to rest before we had to start getting ready to leave Camp 4. So up at 8,000 meters, we spent the afternoon of May 11 resting inside our sleeping bags, dreaming of the summit. There was no wind on the mountain and the sky was clear. The sunset was spectacular. On May 12, 2016, at 8:24am I reached the summit of Mount Everest for the 6th time. It was the perfect day for climbing to the highest point on the planet: no wind or high clouds, not too many people on the mountain or dangerous conditions on the route. When I took the last few steps to the summit I had tears in my eyes that quickly froze to my eyelashes. After giving a hug to Pasang Rita Sherpa, my climbing partner, and congratulating each other, I removed my backpack and took out The Live Love Laugh Foundation’s banner that was rolled inside and had been with me every single day for more than two months. We had reached our goal: climbing to the summit of Mount Everest for mental health awareness. When I planned this expedition, one of my goals was to make an attempt to climb to the summit without supplemental oxygen, something I’d never tried before. That meant spending more time acclimatizing, climbing all the way to the South Col at 8,000m to get ready and also to go later in the season to try to go during the best and relatively warmer weather (perhaps -25º instead of -35ºC). That would only happen by the end of May and my original plan was to climb late. But during the fist days of May I had to cut short my second rotation after just two days because of high winds. 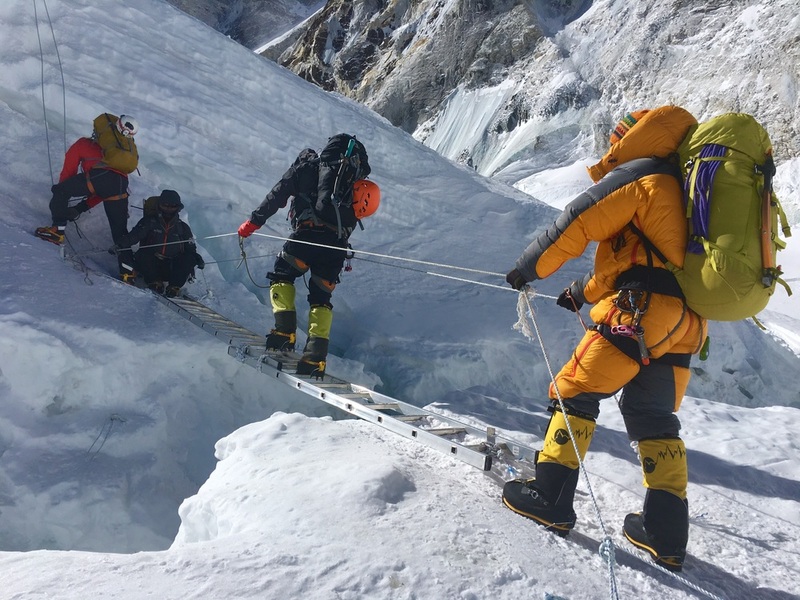 The wind also affected the rope fixing team and they were forced to turn around before the South Col. After so many years spent climbing Everest I knew that being patient and adapting are some of the keys to a successful climb and that’s exactly what I did. I found myself back at my base camp on May 3rd. Dr. Nima Namgyal Sherpa, our base camp manager was one of the people coordinating the rope team’s movements up and down the mountain. Nanga Dorjee, the leader of the Sherpas working with Asian Trekking, was sending his team to get the camps ready. I met with both of them every day to keep track of the progress. The third person that was essential to our success this season was Michael Fagin who, bases halfway around the world, provided the extremely accurate weather forecasts that I used to make decisions about when to climb. While I was recovering at base camp on May 4th, two things happened. 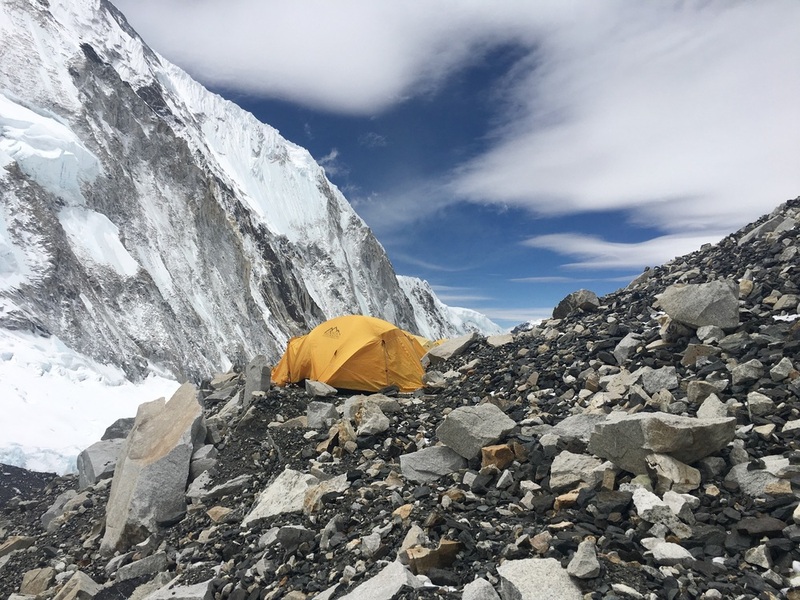 The Sherpas finally reached camp 4 at the South Col and the weather reports started showing much lower than usual wind speeds between May 9 and 12. The jet stream would be away from the mountain. They showed a significant increase starting on the 13th. I was still missing one rotation to the South Col to feel comfortable enough to try climbing without oxygen. But the weather forecast was just too good to ignore. And it really seemed like the Sherpa would make an effort to reach the summit on the 11th of May. One of the biggest lessons I’d learned on Everest on 2011 is to try to avoid being stuck with a lot of people going to summit on the same day. That year I decided to turn around because of a massive traffic jam below the Balcony. I promised myself that would never happen to me again. And it seemed like nobody else was aiming for the 12th of May since there was no certainty that the Sherpas would reach the summit on May 11. There had been delays before. It was a gamble. But I decided to put my trust on the Sherpa. On May 6th I packed once again but this time I got everything I need to reach the summit that wasn’t already at camp 2: my down mittens, high altitude boots, down suit, the banner and my oxygen mask. That’s right. After debating this issue a lot, and I mean hours and hours thinking about it, I decided the only safe way to go for an early summit was by using supplemental oxygen. What tipped the scale in favor of going with oxygen was that my main goal still was bringing The Live Love Laugh Foundation’s banner to the summit of Everest to raise awareness about mental health. Going early, with no crowds and using supplemental oxygen would give me the best chance to achieve this goal. The new plan was to climb up to camp 2, keep track of the Sherpa’s progress and the weather for May 12th, and if everything still looked good, move up to camp 3 on the 10th, camp 4 on the 11th and then to the summit. At 2:30am on May 7, climbing with Pa Rita Sherpa, we did a final puja at base camp and left to climb the Khumbu Ice Fall one more time. Base camp this year seems as big as the last two times I’ve been here in spite of the disasters from the last two years. It’s still a crowded tent city that sprouts at the beginning of April and it’s almost completely gone during the first days of June. We had our blessing ceremony on April 21st, and the multicolored prayer flags rose over our tents. Just two days later, at 3:00am, I started moving up the Khumbu Icefall and straight to Camp 2. The icefall is one of the most unstable sections of the route we’re climbing. In 2014 over a dozen Sherpa lost their lives when an avalanche fell over the icefall and just last year the earthquake swept the rout and we had to be evacuated via helicopter from above Camp 1. It’s covered with huge crevasses we cross with aluminum ladders tied together over them. The route through the icefall changes every time we move up and down. It’s difficult to be objective with this kind of analysis but I believe this year the icefall is in one of the worst conditions I’ve seen. Usually snow covers parts of the seracs, making it more stable and passage is faster. Now, after a very dry winter, it’s almost made of chunks of ice, big and small, that obviously came from multiple collapses. I arrived at Camp 1 after dawn but before the sun hit the glacier. Then came the frustrating climb along the Western Cwm. From the amphitheater made from Everest, Lhotse and Nuptse, snow accumulates and forms the Khumbu glacier. It is not very steep or technically challenging but between the extreme heat and the long distance, it wears out any climber and the hike seems endless. Seven hours after leaving base camp, I reached Camp 2 at nearly 6,500m. Camp 2 is considered an Advanced Base Camp since it’s “safe” location allows us to have a small kitchen and dining tent, making our stay relatively comfortable. I remained at camp 2 for four nights. The first two were extremely windy but the weather improved later on. Sleeping was hard at the beginning and on the first night, as exhausted as I was, I spent most of it lying awake and listening to music on my iPod. During the days, I tried to move around as much as possible and climbed to the base of the Lhotse face. By the end of those four nights I was feeling the benefits of acclimatization, having no more headaches, moving faster and sleeping better. But it was time to head down to thicker air. I started my descent at 5:30am at the time I considered it was safer to go through the icefall. A few hours later I was having breakfast at base camp. That was the end of my first rotation. Tomorrow at 2:30am I’m heading back up to Camp 2 and I will be gone for 6 days while I climb up to the South Col at 8,000m where Camp 4 is located. That will be my final rotation before the summit push. For the last 12 years I’ve been climbing in the Himalayas where I've summited several 8,000m peaks including reaching the summit of Mount Everest five times. The last one was in 2013 when I was able to finally complete an ambitious challenge: reaching the summit of Everest two times in the same season, from both sides of the mountain (Nepal and China). I was able to achieve this with only 8 days between summits. For these adventures I've had no sponsors and no commitments. It's not my job and I do it as a personal challenge. So why go back again this year? The first part of the answer is that every time I’ve climbed Everest I’ve had a unique goal. The first time, in 2005, it was just to reach the summit of the highest mountain on Earth. It was a difficult year because of the tough weather conditions but I reached my goal. I went back in 2008 to climb Lhotse (fourth highest mountain) and Everest, reaching both summits within 5 days. I then took on the challenge of the Double Summit and I had to go back three times to complete it. In 2010 I was only able to reach the summit once from Nepal and the next year I had to return home after turning around on summit day in conditions that I didn’t feel were safe for climbing. 2013 was the big year when I reached the summit for the 4th and 5th time and set my record. On every one of those expeditions I used supplemental oxygen and last year I was going to climb without it for the first time. On April 25th 2015 around noon, I was at 6,300 meters on Everest's camp 2 when the glacier started shaking violently under our feet as a massive earthquake hit Nepal and killed over 8,000 people. The expedition was cancelled but I stayed behind to help with disaster relief. So in the next few days I will be traveling halfway around the world, again, to try to achieve this goal of climbing without oxygen. The second part is the most important for me right now. Last year I completed a nearly 10,000km motorcycle ride across northern and central India. I did it alone, on a Royal Enfield Bullet 500 motorcycle made in Chennai, in Southern India. Now that I think about, it’s odd that in so many years of traveling I’d never been to that amazing country. So, just like I do when I plan every other adventure, I researched my destination as much as I could before the trip. During June of 2015 I was following the news in India every day and that’s when I first read about Deepika Padukone and The Live Love Laugh Foundation. Deepika is arguably the most celebrated leading lady in India’s prolific film industry. Earlier in 2015 she opened up about her struggles with depression. In India, as in may other countries, mental health issues are taboo and the people that suffer them usually have to deal with them in the dark. They rarely get the medical and social support they need. In order to bring these issues to light, Deepika put together a team of experts and in September officially launched The Live Love Laugh Foundation against depression. Some of the Foundation’s main goals are to raise awareness and remove the stigma attached to mental health issues, to provide information about the causes and symptoms of depression and other mental illnesses, and to direct people to medical professionals that can provide help. I was deeply moved by Deepika’s story. Several family members have suffered from mental health problems. When those problems have been addressed and treated, the result have been completely positive. On the other hand, when treatment has been rejected and even acknowledging that there is a problem has been denied, the results have been tragic for them and their loved ones. Therefore, depression and mental health are issues that are close to me and that I take very seriously. I’ve now been climbing for 23 years and going on international expeditions for the last 13. Something I learned early on is that whether I’m climbing, sailing, paragliding, long distance running, or any of the activities I do, my goals are very personal. Even when I succeed, those achievements don’t make someone else’s life better. Almost a decade ago I began sharing my experiences through social media and my blog, hoping to inspire others to live an exciting life with personal goals and, perhaps adventure. But still, something was missing. That’s why I decided to work with different organizations and try to raise funds and awareness to their causes with the goal of making someone's life a little better. When I finished my motorcycle trip in Delhi last December I jumped on a plane to Bangalore and met with Mr. Aashu Calapa, the Foundation’s director. We talked about ways that I could support the Foundation's goals through my activities. For that reason, this spring I will be carrying The Live Love Laugh Foundation’s banner to the summit of Mount Everest. Although it doesn’t compare with how challenging it can be for them, I believe that bringing the banner to the highest point on earth is symbolic of the struggle that people go through to overcome depression and mental health problems. By sharing this adventure through traditional and social media, we expect to reach millions of people and let them know that there is no shame in dealing with these issues, that help is out there and that with the proper support there is light beyond those dark times. The expedition will last for two months, April and May with a possible summit day between May 15 and 25. The way you can help us is by visiting the Foundation’s website www.thelivelovelaughfoundation.org and sharing it with anyone close to you that is going through tough times. Also, please use the hashtag #YouAreNotAlone to let them know there are others that care about them. Thank you for sharing yet another adventure with me and this time for a very important cause. Despegue y explosión del cohete Falcon 9 desde la NASA. Cómo el espacio sigue siendo una aventura. Vine al Centro Espacial Kennedy para ver el lanzamiento del cohete Falcon 9 de SpaceX, la compañía de Elon Musk, y hacer una cobertura del evento en las redes sociales. El día de hoy, aproximadamente dos minutos y medio después del despegue, la nave explotó y se desintegró. Fue un final desafortunado, pero parte de una experiencia de tres días que viví en el Centro Espacial Kennedy de la NASA. Así viví esos días. La fecha original del lanzamiento del CRS-7 (séptima misión del Sistema Comercial de Reabastecimiento) era el 26 de Junio de 2015. El objetivo de la misión: llevar equipos y provisiones a la Estación Espacial Internacional, así como experimentos que se realizarían en la nave durante su permanencia en el espacio. Como un objetivo secundario, se llevaría a cabo el tercer intento de aterrizar y recuperar la primera etapa del cohete Falcon 9 sobre una barcaza en el Océano Atlántico. Por temas de presupuesto, en vez de ser la NASA quien envía estas provisiones y equipo directamente, se trata de empresas privadas como SpaceX y Boeing quienes se encargan de realizar estos lanzamientos. Varias semanas antes recibí un correo en el que estaba aceptada mi participación para cubrir el despegue a través de las redes sociales. Era un evento de tres días en los que participaría en un número de conferencias de prensa y visitas a varios laboratorios y centros de procesamiento del Centro Espacial Kennedy, dándome el mismo nivel de acceso que la prensa tradicional. Hubo un proceso de verificación y autorización para que yo participara como extranjero. Por razones que aún no conozco, el lanzamiento fue pospuesto al domingo 28 de Junio, y entonces el evento se cambió para el viernes, sábado y domingo. Aunque he tenido oportunidad de visitar este centro de la NASA en otras ocasiones, estaba verdaderamente emocionado de poder tener un acceso privilegiado y de poderlo compartir. Muy temprano el viernes 26 de Junio me presenté en la oficina donde ese emiten las identificaciones y los pases de acceso a la NASA. Actualmente el gobierno de Estados Unidos tiene un nivel de seguridad más elevado de lo normal en sus instalaciones y en todo momento, como extranjero llevaba una escolta acompañándome. Ya con mi identificación, me dirigí al centro de acreditación de prensa donde me entregaron mi credencial, información sobre la misión CRS-7 y un programa detallado para los siguientes días. Una camioneta nos llevó a los extranjeros a través de los retenes de seguridad y hasta el histórico Centro de Prensa. Durante los días que estuve en el Centro Espacial Kennedy, en todo momento sentí el legado de los programas espaciales anteriores como Mercury, Gemini, Apollo, Skylab y el Transbordador Espacial. El Centro de Prensa es para mi un sitio histórico desde donde se ha reportado el inicio de algunas de las más extraordinarias aventuras humanas. La primera visita que realizamos como parte de los medios de comunicación fue al laboratorio donde se fabrican los materiales aislantes que protegen a las naves de las temperaturas a las que se enfrentan en el espacio. El avance en el desarrollo de estos materiales en los últimos 30 años ha sido exponencial pero hay cosas que realmente no cambian y siguen un proceso casi artesanal. El personal que ahí labora también tiene décadas realizando y perfeccionando esta labor. La primera conferencia de prensa en la que participé fue sobre algunos de los experimentos y equipo que se estaría enviando a la Estación Espacial. Me pareció muy interesante que se prueben sistemas de nanotecnología para la administración de medicamentos y me llamó la atención que se enviarían los lentes holográficos de Microsoft llamados HoloLense para que los astronautas puedan recibir instrucciones y trabajar junto con los técnicos en la tierra con hologramas proyectados en los lentes. Una tecnología fascinante. La segunda visita fue al Vehicle Assembly Building o Edificio de Ensamblado de Vehículos. Este colosal edificio ha sido testigo del ensamblado de todos los cohetes que llegaron a la luna y en este momento está siendo renovado para poder ensamblar en él los cohetes SLS que llevarán al hombre a Marte. Es el edifico más grande en el que he estado parado. Por la tarde de ese primer día participé en otra conferencia de prensa sobre el estatus del cohete Falcon 9 y el clima esperado para el día del lanzamiento. Todo se veía bastante positivo. El sábado 27 el itinerario era más relajado. Realizamos una visita al Centro de Procesamiento de la Estación Espacial Internacional donde pudimos ver las partes que se estarán enviando a la estación espacial, incluyendo una réplica del adaptador que estaba a bordo del cohete Falcon 9 de la misión CRS-7. Todos los componentes que se encuentran a bordo de la estación espacial han pasado por este enorme edificio. Más tarde nos tocó una conferencia de prensa en la que dos niños de secundaria platicaron sobre el experimento que diseñaron para volar al espacio dentro del cohete. Se trata de una pequeña caja con gusanos que van en estado criogénico, son “descongelados” en el espacio y de esa manera se observa si se puede lograr el compostaje de materiales en gravedad zero. Finalmente hubo una conferencia de prensa en la que se habló del estatus del vuelo en cohetes tripulados de Estados Unidos y terminaron de esa forma las actividades programadas para los medios ese día. Esa misma noche del sábado, me fui a descansar algunas horas ya que a las 12:15am del Domingo 28 de Junio, y a tan solo 10 horas del lanzamiento, regresé al Centro Espacial Kennedy para un recorrido cerca de la plataforma de lanzamiento 41 donde se encontraba el Falcon 9. A la mitad de la noche, el cohete completamente iluminado contrastaba con la oscuridad que nos envolvía. Estaba rodeado por cuatro torres que funcionan como pararrayos por las constantes tormentas eléctricas que hay en el estado de Florida. Fue hasta las nueve de la mañana del domingo, una hora y veintiún minutos antes del lanzamiento, cuando abordamos los autobuses que nos llevarían al lugar que se había designado para que la prensa viera el despegue a menos de 6km de la plataforma. Escuchábamos a través de altavoces los comentarios del Centro de Control de Lanzamiento y de esa manera seguíamos la cuenta regresiva. Instalé dos cámaras con sus tripiés, una para video y otra para fotografía, configuré mis controles remotos y me preparé para el despegue. Algo que se dice de cuando se es testigo del despegue de un cohete es que primero se ve, luego se escucha y finalmente se siente. Cuando la cuenta regresiva llegó a cero, se comenzó a ver una nube de humo alrededor del cohete y segundos después se distinguía cómo comenzaba a elevarse. Las flamas generadas por los motores brillaban intensamente incluso a la mitad del día. El cohete Falcon 9 siguió acelerando y ganando altura. Ya que se encontraba cerca de la primera capa de nubes empecé a escuchar el sonido de los motores. Es muy particular este sonido pero podría describirlo como una mezcla de una motocicleta verdaderamente ruidosa, con los motores de un gran avión de pasajeros a máxima potencia. Tiempo después, sentí sobre mi cuerpo la vibración generada por las ondas acústicas. El cohete cruzó la zona de máxima presión dinámica y, cuando ya pensaba que lo iba a perder de vista, se formó una gran nube. Algo había salido mal. Escuchamos que a través del audio del control de lanzamiento anunciaban que había habido un VLF o Vehicle Launch Failure. Una falla en el lanzamiento del vehículo. El cohete había explotado. -Se seguían analizando los datos pero se había detectado una presión inusual en un tanque de oxígeno al momento de separar la primera y segunda etapa del cohete. -Este es el tercer cohete que explota de manera consecutiva (los otros dos habían sido de otras compañías y países, no de SpaceX y NASA) que llevaba provisiones para la Estación Espacial Internacional, pero los astronautas que ahí se encuentran por el momento no están en riesgo por falta de agua, oxígeno o alimento. -El 3 de Julio se realizará otro lanzamiento. -Consideran que no hay un impacto negativo para el proyecto de llevar astronautas a la Estación Espacial Internacional en cohetes tripulados de Estados Unidos para Diciembre del 2017. Pero el comentario que escuché de esta conferencia de prensa y que considero el más valioso es que lanzar cohetes al espacio, ya sea tripulados o sin tripulación, no es algo fácil ni rutinario. Aunque el hombre lleva casi 55 años yendo al espacio, el salir de nuestro planeta sigue siendo una aventura y el resultado de la aventura es incierto. Lo comparo con las experiencias que tengo en las montañas en las que a pesar de tratar de minimizar al máximo el riesgo sobre el que tengo cierta influencia, existe un número de factores que hacen que el desenlace sea incierto. Eventos como la explosión de este cohete Falcon 9 no deben detener ni retrasar el esfuerzo del hombre por explorar nuestro universo. Deben de servir de lección para aprender de ellos, mejorar y volver a intentar hasta tener éxito. Espero en un futuro no muy lejano poder ser testigo de un lanzamiento exitoso que sea la prueba de este principio de perseverancia. En estos últimos diez años he vivido todo tipo de experiencias y aventuras en su mayoría relacionadas con retos deportivos. Pero en esta ocasión tengo la oportunidad de vivir una completamente diferente, que tiene que ver con uno de los temas que más me emocionan: la exploración espacial. Voy de camino a Florida, al Centro Espacial Kennedy de la NASA, para cubrir en redes sociales el lanzamiento del cohete SpaceX CRS-7 programado para el domingo 28 de Junio. Es un evento de tres días en los que estaremos haciendo recorridos por las instalaciones del centro espacial y visitaremos el cohete en la plataforma de lanzamiento el mismo día del despegue. Sin duda va a ser una experiencia diferente. Mi interés por el espacio y la exploración espacial va décadas atrás. El primer libro que escogí y compré (no de los que le regalan a uno de niño) fue uno bastante técnico sobre desempeño aerodinámico y mecánica de fluidos. Tenia 10 años y, aunque no lograba a entender las fórmulas y cálculos, despertaba en mi aún más curiosidad. Creciendo, me gustaba todo lo relacionado con la astronomía, cohetes y naves espaciales. Construía y lanzaba mis propios cohetes y mi libro favorito era un “Manual de Operación” del Transbordador Espacial que describía la función de cada uno de los botones de la cabina de esa nave. Mi museo favorito: el del Aire y del Espacio en Washington D.C. Nunca me ha dado por pedir ni juntar autógrafos pero los únicos que tengo son dos fotografías firmadas. La primera está firmada por Buzz Aldrin (astronauta del Apollo 11 que pisó la luna después de Neil Armstrong) y la otra está firmada por Werner Von Braun quién fue un ingeniero alemán que después de la segunda guerra mundial trabajó para la NASA y que diseñó los cohetes que llegaron a la Luna. Esas son de las pocas cosas materiales que realmente atesoro. También tengo de recuerdo un pedazo de la cerámica que servía de aislamiento en el fuselaje del Transbordador Espacial. Aunque me hubiera gustado estudiar ingeniería aeroespacial y trabajar en ese campo, la vida había trazado otro camino para mi. Ya en épocas más recientes he tenido oportunidad de vivir dos experiencias relacionadas con la exploración espacial. La primera fue en 2009 cuando vi el último despegue de noche del transbordador espacial, la misión STS-128. El lanzamiento fue retrasado durante cinco días y al final valió la pena la espera al ver como en la noche todo el cielo se iluminaba mientras el cohete dejaba la tierra. La segunda ocurrió un año y medio después cuando realicé un vuelo en un avión Boeing 727 modificado en el que, a través de parábolas en las que el avión se iba a pique y posteriormente subía rápidamente, se lograban momentos de microgravedad como la hay en el espacio. Es imposible describir la emoción de estar flotando dentro de una aeronave. El despegue. ¡Era media noche! La misión CRS-7 (Commercial Resupply Services) tiene como objetivo principal llevar provisiones a los astronautas en la Estación Espacial Internacional que incluye experimentos científicos, equipos para mantener a la tripulación durante su estancia y alimentos, entre otros. Pero esta misión tiene un elemento que la hace especial. Será el tercer intento por recuperar la primera fase del cohete, intentando que aterrice de manera vertical sobre una barcaza en el océano atlántico pocos minutos después del despegue. Space X piensa que en esta ocasión lo logrará. El despegue está programado a las 10:21am hora del este de los Estados Unidos, 9:21 hora del centro de México. Seguiré compartiendo a través de las redes sociales la experiencia de experimentar un lanzamiento como lo vive la prensa. Serán tres días emocionantes. A un mes del terremoto en Nepal, así lo viví. El campamento dos del Everest en el lado de Nepal se encuentra a 6,350 metros de altura, cerca de la base de la pared el Lhotse. Esa mañana del 25 de Abril desperté a las 2am para escalar dese el campamento base hasta el campamento dos, pasando por la famosa cascada de hielo del Khumbu. Era un día nublado, pero se alcanzaban a ver partes de las paredes nevadas del Nuptse, Lhotse, Everest y West Shoulder. A pesar de que algunos días antes había conseguido llegar a la cima del pico Lobuche Este a 6,100 metros de altura, sentía la falta de oxígeno y recordaba que a penas me encontraba en la primera mitad de la expedición al Everest que normalmente dura dos meses y que aún me esperaba aún un proceso largo de aclimatación. Alrededor de medio día, estaba descansando entre las tiendas de campaña cuando se sintió un fuerte movimiento en el hielo sobre el que se encuentra el campamento, seguido inmediatamente del sonido de una inmensa avalancha sobre el Nuptse. Basándome en mi experiencia de 22 años, primero pensé que el movimiento del suelo se debía a las toneladas de hielo que iban cayendo y sacudiendo el glaciar. Pero segundos después, el suelo comenzó a moverse de una manera verdaderamente violenta y a nuestro alrededor comenzaron a detonarse múltiples avalanchas de todas las montañas. Nunca me hubiera imaginado que justo en ese momento miles de personas perderían la vida y que cientos de miles se quedarían sin hogar. Una de las tragedias más grandes en a historia del pueblo de Nepal había comenzado. Como todas las expediciones a los Himalaya, para mi la aventura comienza meses antes con la planeación de la logística, los permisos y el entrenamiento físico. He tenido la fortuna de estar parado en la cima del Everest en cinco ocasiones y esta vez tenía el proyecto de intentar subir a la cima de la montaña más alta del mundo sin usar oxígeno suplementario. Para esto, realicé un intenso entrenamiento por el que terminé corriendo dos maratones en un mes y durmiendo durante tres meses dentro de una tienda de campaña con concentraciones más bajas de oxígeno, simulando como si estuviera durmiendo a unos 6,000 metros de altura. Volé a Katmandú a principios de Abril y la primera complicación fue que no llegó ninguna de mis tres maletas. A los pocos días apareció la primera que afortunadamente tenía las cosas más importantes de mi equipo de escalar como botas, sleeping bag, traje de pluma, etc. Las otras dos maletas tardaron casi tres semanas en aparecer y las volví a ver hasta que fueron enviadas al campamento base. Quería darme las mayores probabilidades de lograr el ascenso, por lo que tuve que comprar lo esencial de mi equipo de escalar faltante y mucho de eso lo terminé donando a los sherpas cuando aparecieron todas las maletas. Como parte de la aclimatación tenía planeado realizar el ascenso a dos picos antes de dirigirme al Everest. El primero de ellos, Pachermo, tenía una cantidad inusual de nieve para esta época de primavera y por seguridad decidí no intentar escalarlo. El segundo, el pico Lobuche Este, lo subí en solitario el 22 de Abril y me sentí fuerte, listo para pasar a mi objetivo principal de esa temporada. Los días que pasé en el Campamento Base del Everest a 5,300 m de altura, antes y después de escalar el Lobuche, tenía la costumbre de recorrer todo el campamento caminado antes de la hora de la comida. Durante la temporada de primavera el campamento parece una pequeña ciudad sobre el glaciar del Khumbu hecha de tiendas de campaña donde se ven banderas de decenas de países que vuelan entre las banderas de oración budistas que colocan los sherpas. Al estar sobre un glaciar, es difícil encontrar espacios planos donde instalar las tiendas de campaña y es por eso que el campamento se extiende a través de una zona bastante larga. Es común escuchar avalanchas asiladas, pequeñas y no tan pequeñas, que caen de las montañas a nuestro alrededor, pero nunca me hubiera imaginado que una de ellas podría tener un tamaño grande como para llegar hasta el campamento base. Nunca me había sentido inseguro estando ahí. El 25 de Abril en la madrugada dejé el campamento base para escalar la cascada de hielo y empezar mi aclimatación en el Everest. Por el movimiento violento del glaciar en el campamento dos, y al ver que eran muchas las avalanchas que caían simultáneamente, me di cuenta que estábamos pasando por un terremoto excepcionalmente fuerte. Escuchaba cómo tronaba el hielo bajo nosotros y durante un instante pensé que era una verdadera posibilidad el que se abriera una grieta bajo nosotros y que pudiéramos quedar atrapados dentro de ella. Afortunadamente, la ubicación del campamento dos permitió que las avalanchas, las rocas y los grandes bloques de hielo que se desplomaban cayeran hacia los lados y nos salvamos de ser arrasados. El hielo dejó de moverse y de pronto todo fue silencio. A través del radio me comuniqué al campamento base con el doctor Nima Sherpa para avisarle que estábamos a salvo y supimos que algo grave había pasado en el campamento base pero sin tener detalles. Aunque poco a poco nos fuimos enterando del número de muertos y lesionados en el campamento base, no tuvimos mucha información de lo que realmente había ocurrido sino hasta dos días después. Nuestro primer problema luego del terremoto fue que, como consecuencia de las avalanchas, varias de las escaleras que se usan para cruzar las enormes grietas entre el campamento dos y el uno habían desaparecido. Varios montañistas no podían descender al campamento uno donde estaba su equipo para pasar la noche. En nuestra tienda de campaña comedor tuvimos que improvisar un refugio para seis personas, consiguiéndoles sleeping bags y colchones para protegerse del frío. Durante el 25 y 26 de Abril tuvimos juntas en el campamento dos entre los líderes de las expediciones y nos enteramos de que también la ruta para regresar al campamento base se encontraba en muy malas condiciones y era imposible descender por ella en esas circunstancias. El 27 de Abril por la madrugada, al ver que podría tardar hasta semanas el reabrir la ruta para descender, se decidió evacuar a todos los montañistas a través de helicópteros. 170 personas fuimos evacuadas de entre el campamento uno y dos. Nada me hubiera preparado para la magnitud de la destrucción que me encontré en el campamento base. La zona donde se encontraba mi tienda de campaña había sobrevivido sin daños, pero la parte central, de unos 300 metros, había sido completamente destrozada. El hielo que cayó de la montaña, había arrasado por completo con todo a su paso. Se me figuraba como si hubieran puesto todas las tiendas de campaña y su contenido dentro de una licuadora gigante y después hubieran regado los restos por todos lados. Tengo entendido de que ahí murieron 19 personas y 65 lesionados. Nuestra tienda de campaña comedor fue convertida en un hospital improvisado donde el doctor Nima atendió a varios heridos. Aún habían cadáveres que posteriormente fueron transportados por helicópteros ya que obviamente se daba prioridad a la evacuación de los lesionados. Era un panorama verdaderamente triste. Ya en el campamento base, tuvimos más noticias del tamaño de la tragedia en toda la región central de Nepal. Se hablaba de miles de muertos y de la destrucción de la mayoría de las casas y edificios en varias zonas del país. Una vez que fue evidente que sería muy difícil continuar con el ascenso al Everest y que había mucho por hacer por los damnificados, tomé la decisión de posponer mi proyecto de escalar para el próximo año y dedicarme a apoyar dentro de lo posible en labores de ayuda humanitaria. Así, el 30 de Abril dejé el campamento base, caminando cinco horas hasta Pheriche y al día siguiente, con vuelos en helicóptero, avionetas y aviones, llegué a Katmandú. Al regresar a Katmandú, la capital de Nepal, me imaginaba un panorama de mucha más devastación. Es cierto que la ciudad estaba prácticamente vacía, con casi todos los comercios cerrados y las calles desiertas. De vez en cuando se veían edificios derrumbados pero eran relativamente pocos. Los edificios más grandes, como centros comerciales y oficinas, parecían haber sufrido mayores daños y seguramente tendrán que ser demolidos. Esa misma tarde del 1 de Mayo me dirigí a la Casa de las Naciones Unidas en donde se estaban coordinando las labores de ayuda humanitaria, atención médica y entrega de alimentos. También ahí se estaba registrando a los voluntarios. En ese momento y en los siguientes días pude ver de primera mano la extraordinaria respuesta que tienen los organismos internacionales ante desastres naturales, con protocolos establecidos y con planes que pueden implementar rápidamente dependiendo del tipo de contingencia. En especial pude ver la extraordinaria actuación de UNICEF y se la Organización Mundial de la Salud, WHO. de Turquía y a REDOG (perros para búsqueda de sobrevivientes) de Suiza quienes ya estaban operando en Nepal tan solo 22 horas después del primer terremoto y lograron rescatar con vida de entre los escombros a varias personas hasta 72 horas después del sismo. Junto con ellos y una escolta militar visité Durbar Square, la plaza principal de Katmandú, que perdió por completo la mayoría de sus principales templos y construcciones, y dejó con daños severos el antiguo palacio real. Parecía una zona de guerra. Mi labor fue tomar cientos de fotografías para documentar el daño ante UNESCO por ser un sitio designado como patrimonio de la humanidad. Posteriormente mi labor durante varios días fue la de participar en la entrega de alimentos y lonas en poblaciones alrededor del valle de Katmandú y ahí fue donde realmente vi la magnitud del daño, visitando pueblos aislados en donde prácticamente todas las casas se habían derrumbado y la gente estaba viviendo a la intemperie. Uno de los grandes problemas que enfrentará el pueblo de Nepal en los siguientes meses es que ya está iniciando la temporada del monzón que durante el verano trae intensas lluvias. Sin casas ni refugios, la gente comenzará a enfermarse y pienso que podrían generarse epidemias, a demás de que los deslaves dejarán incomunicadas cientos de poblaciones. Es por eso que es una prioridad la entrega de lonas para que la gente pueda tener un refugio durante el monzón y en Agosto o Septiembre, puedan iniciar con la reconstrucción de sus viviendas. Dos semanas después del terremoto, cuando consideré que estaba dejando de ser útil y que eran más los recursos que estaba utilizando que la ayuda que estaba brindando, decidí iniciar mi regreso a México. De esta experiencia me llevo muchas cosas, muchas buenas y algunas malas. Entre las malas, el ver la actuación de un gobierno abusivo e incompetente que hasta en momentos críticos actuó bajo intereses políticos incluso llegando a tratar de bloquear las labores de las organizaciones internacionales. Otro aspecto que vi con tristeza es que ciertas personas, tal vez sin tener ningún mérito personal, aprovechan estas tragedias para aparecer ante los medios de comunicación simplemente por encontrarse en el lugar del desastre. Pero son muchas más las cosas positivas, como la satisfacción de haber podido ayudar durante momentos difíciles para un país del que he recibido mucho en más de una década. También me queda la grata realidad de la solidaridad de la comunidad internacional en casos de desastres naturales y el ver que se pueden hacer cosas constructivas de forma muy rápida cuando se tiene la voluntad. Me llevo el recuerdo de la gente de Nepal que, a pesar de vivir en uno de los países más pobres del mundo y de haber perdido sus bienes materiales, tienen un espíritu de perseverancia admirable que los hace sobreponerse a todo. Espero tener la oportunidad de regresar el próximo año a Nepal para concluir mi proyecto. Mientras tanto, hay otras montañas por escalar, otros cielos por volar y otros mares por navegar. Antes de iniciar el regreso a México, cansado pero satisfecho. Todo depende de la actitud: Maratón de Tokio y maratón de Roma. Hay veces en las que todo va de acuerdo a lo planeado y otras en las que parece que nada funciona como debería, surgiendo un contratiempo tras otro. A pesar de todo, el resultado puede ser inesperado y hoy más que nunca me queda claro que todo de pende de la actitud con la que enfrento los retos. Esta historia de dos maratones es un ejemplo de ello. Hace meses decidí participar en dos maratones como parte de mi entrenamiento. El primer reto sería el de Tokio, el 22 de Febrero, seguido del maratón de Roma 28 días después, el 22 de Marzo. Aquí vale la pena hacer la aclaración de que un maratón mide una distancia estándar de 42.195 km aunque muchas personas usen el término maratón como sinónimo de “carrera” sin importar la distancia. Tanto Tokio como Roma son maratones con la distancia certificada. Durante tres años había intentado conseguir una inscripción para el maratón de Tokio sin haber sido seleccionado en el sorteo para asignar números. Pero finalmente en Mayo de 2014, nueve meses antes de la competencia, logré asegurar mi inscripción para la edición de 2015. Inicié el entrenamiento en Diciembre. A pesar de estar corriendo y participando regularmente en carreras desde que tenía 15 años, en esta ocasión tuve que empezar el entrenamiento prácticamente desde cero debido a que el accidente que tuve en Noviembre en los Himalaya dañó gravemente el músculo de mi muslo derecho. Me apegué a mi programa de entrenamiento y superé la tentación de aflojar el paso durante las fiestas de Diciembre. Realizaba mis carreras largas semanales con toda regularidad e incluso, cuando el clima no lo permitía, llegué a correr 24 km en una caminadora. Días antes del maratón en Tokio, viajé hasta Japón y con toda la calma tuve oportunidad de adaptarme un poco a las horas de diferencia con América, visitar la expo para recoger mi número, preparar mis cosas para correr y dormir bien la noche anterior a la competencia. El 22 de Febrero, el día de la carrera, me desperté con tiempo para desayunar y caminar con calma al corral de arranque. El clima era ideal, unos 8 grados centígrados y casi nada de viento. La primera mitad de la competencia la hice a un ritmo conservador, disfrutando la ciudad y a los más de un millón de espectadores que nos animaban. Cruzando los 21km apreté el paso, cerrando fuerte y llegué a la meta en 3:41:31, y rompiendo mi mejor marca anterior en maratón de Dublín por 14 segundos. De las cuatro semanas que tenía antes del maratón de Roma tomé la primera para recuperarme, enfocándome principalmente a la bicicleta estática y corriendo como máximo 8 km. Después me dediqué a hacer entrenamientos de velocidad y tenía planeado hacer una carrera larga de 28 km pero por compromisos de trabajo tan solo pude hacer un entrenamiento “largo” a paso rápido de 14 km. El viaje a Roma parecía que iba a ser algo sencillo pero terminó siendo una pesadilla. El plan era volar a Frankfurt, en Alemania en la madrugada del viernes 20 de Marzo para hacer una conexión corta al aeropuerto de Fiumicino en Roma. Ese mismo día tenía pensado recoger mi número en la expo del maratón. La primera señal de que no todo estaba bien era que a los agentes en el mostrador en Estados Unidos el sistema no les dejaba imprimir mi pase de abordar de Frankfurt a Roma y me sugirieron que lo solicitara a mi llegada. Pero al bajar del avión, ya en Alemania, nos informaron que había una huelga de pilotos de Lufthansa y que habían cancelado la mayoría de los vuelos. Para resumir una muy larga historia, sin poder volar a ningún destino en Italia, tuve que pedir que me cambiaran de ruta para volar a Ginebra, en Suiza. Pero mi maleta se perdió en el camino. Sin equipaje, tomé un tren de Ginebra a Milán pero no habían lugares para los trenes de Milán a Roma sino hasta la tarde del sábado. Me vi forzado a rentar un coche y manejar siete horas. Llegué al hotel en la madrugada del sábado tras 30 horas de viaje y completamente agotado. El sábado 21 asistí a la expo para recoger mi número de competidor y para comprar calcetines para correr y shorts ya que mi maleta con toda la ropa y equipo de correr seguía extraviada. Todo corredor sabe que no es recomendable estrenar nada el día de una competencia para evitar lesiones, ampollas, rozaduras, etc. Esta vez no tenía opción. Finalmente llegó el día del maratón de Roma pero el clima tampoco sería favorable. Llovía ligera pero constantemente. Cuando desperté esa mañana y vi la lluvia lo primero que pensé fue: “¿qué más puede salir mal en este viaje? Ha sido un desastre tras otro”. Cerré los ojos y en ese momento decidí que el calificar algo como un “desastre” dependía completamente de mi actitud y en ese momento decidí que iba a ser la mejor carrera de mi vida y que a pesar de todo lo iba a disfrutar y a realizar mi mejor tiempo, que para eso había entrenado. Unos minutos después de haber salido del hotel, con la lluvia, mis tenis estaban empapados y pesados. La extraordinaria organización de la carrera y el correr en una ciudad maravillosa como Roma compensó por mucho las incomodidades. Durante todo el recorrido, me asombraba al dar la vuelta en una calle y encontrarme con monumentos espectaculares, plazas gigantes y edificios de cientos de años. Crucé el medio maratón en 1:45:20 y me di cuenta que tenía verdaderas posibilidades de terminar en menos de 3:30:00 si aguantaba el paso. Hice mi mejor esfuerzo pero los últimos dos kilómetros tuve que bajar la intensidad (mi velocidad promedio durante todo el recorrido fue de 12 km/h) y crucé la meta junto al Coliseo en 3:31:30 para un nuevo récord personal. La gran lección que me llevo es que hoy me queda más claro que nunca que el resultado de cualquier proyecto o reto que me ponga depende en su mayor parte de la actitud con que lo enfrente. Me pregunto si hubiera hecho un viaje a Roma sin vuelos cancelados, sin maletas extraviadas y con un clima más favorable, ¿hubiera roto mi récord anterior por casi 10 minutos y hecho una carrera tan buena? Tal vez no. Las circunstancias fueron las que me llevaron a decidir tomar una actitud triunfadora a pesar de todos los contratiempos.